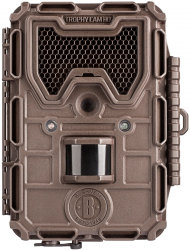 OVERLAND PARK, Kansas – June 18, 2015 – TrailCamPro.com, considered the foremost testing authority in trail cameras, recently reviewed more than 50 of the latest camera models from more than a dozen manufacturers. During that comprehensive test, the new Bushnell® Trophy Cam® Aggressor received high marks, including several first place wins. The Bushnell Aggressor features a 0.2 second trigger speed to capture moving game with a one second recovery, so you don’t miss the next shot. Nighttime images have been improved and the camera now shoots 14 MP still images and 1080p HD video with sound. The camera takes up to eight AA batteries for up to one year of operation in the field. The Trophy Cam Aggressor has a number of customizable features that are easily programmed to allow users to get high quality images and video under a wide variety of environmental conditions.